POP displays, or Point of purchase displays are the marketing materials and signs used to enhance products for sale in a retail environment. Generally located at the checkout area or other location where the purchase decision is made, these displays are meant to help increase unplanned purchases. Typically used for end-cap displays at grocery stores, or in a mall environment like clothing stores, POP displays can be one of the most important type of signs your product can have to help it stand out. Not only are these displays meant to increase business, but they also have a strong purpose to establish brand awareness. We help design and build kiosks, end cap displays, checkout counter signs and ceiling hanging signs for all types of businesses. We also make sure the design is done right. Don't settle for a low-quality POP display, when it will directly affect your company's image. 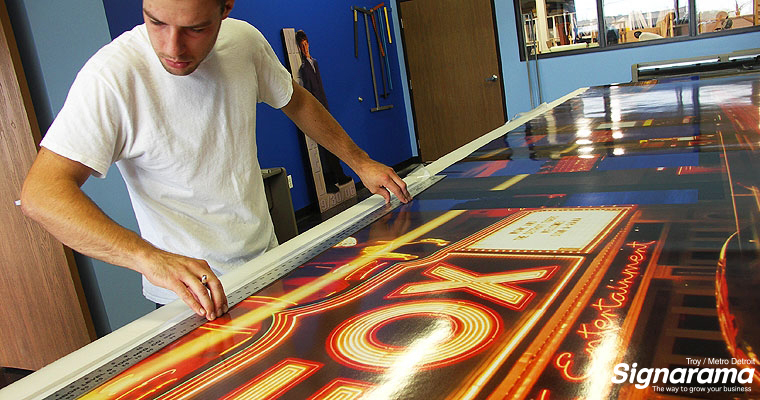 Our special printing equipment was built to produce point of purchase displays fast and economically. From corrugated plastic (coroplast) to custom printed cardboard boxes, we can help you! Contact Signarama Troy to learn how we can help your business stand out with a high-quality point-of-purchase display.